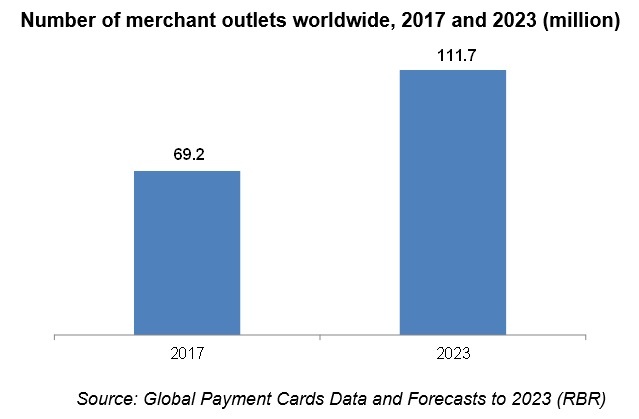 The number of merchant outlets accepting card payments worldwide grew by 13% throughout 2017 to reach 69.2 million at the end of the year. The two least developed regions in terms of acceptance, Asia-Pacific and central and eastern Europe, were also those which grew the fastest, driven in part by new regulation. For example, in India the government has placed caps on terminal charges and has also put pressure on banks – many of which are state-owned – to increase efforts to recruit merchants. In Czechia, merchants are now required to keep electronic records of sales, and accepting cards at EFTPOS terminals allows them to do so efficiently. Regulations on interchange fees are also having a knock-on effect on merchant service charges. As the fees which acquirers have to pay to issuers fall, merchants are more confident about refusing to pay higher fees themselves. This then encourages merchants to begin accepting cards when they were previously reluctant. This is most commonly the case in the European Union, where interchange fees were capped in 2015. It also applies in Brazil, where a cap on debit card interchange fees was announced in March 2018, and in Malaysia, where interchange fees have been capped since 2015 as part of the country’s Payment Card Reform Framework. The number of outlets which accept cards is forecast to grow at an average of 8% per year between the end of 2017 and the end of 2023 to reach 111.7 million, according to RBR. There is potential for significant growth in some markets in Asia-Pacific, central and eastern Europe and the Middle East and Africa, as ongoing financial inclusion initiatives are boosting card issuance, thereby encouraging acceptance. Tourism can also be a significant driver of growth in acceptance; Japan is a prime example, where the 2020 Tokyo Olympics is driving the government to facilitate tourist spending. Despite these measures, it should be noted that in many developing markets, acceptance is still held back by a lack of infrastructure or the geography of the country, for instance when it is made up of a large number of islands or has large remote, rural areas. Examples of this are Indonesia and the Philippines. “Merchants across the world are being persuaded of the benefits of accepting cards, even for low-value payments. As consumers increasingly expect to be able to pay by card, the number of outlets where they can do so will continue to grow,” comments Daniel Dawson, who led the RBR study. The post Strong growth in card acceptance fuelled by consumer demand and government campaigns appeared first on Payments Cards & Mobile.